Rock art is found on every continent, except for Antarctica. Although this form of expression is universal, each continent has its own characteristics in terms of site location, representations, dating and purposes. The exact number of rock art sites in the world has yet to be known, but they seem to abound in the hundreds of thousands. Estimating their numbers is all the more difficult, since the concept of a rock art site remains ambiguous. Nonetheless, a site can refer to an entire region with thousands of scattered rock art images or well-defined places, such as a cliff or a cave, with only a few representations. Australia and the African continent are among the richest in terms of rock art site diversity and number. Hundreds of thousands of sites are found across the Australian land. Their largest concentrations are in the Kimberley, Arnhem Land, Laura and Pilbara regions. Created over an extensive period of time, rock art may date as far back as 40,000 years and it continued to be made into the 20th century. It is the most ancient and long-standing tradition of rock art production in the world. Carvings of life-size giraffes at Dabous in the Saharan Desert, Niger. These images could be 6 000 years old. 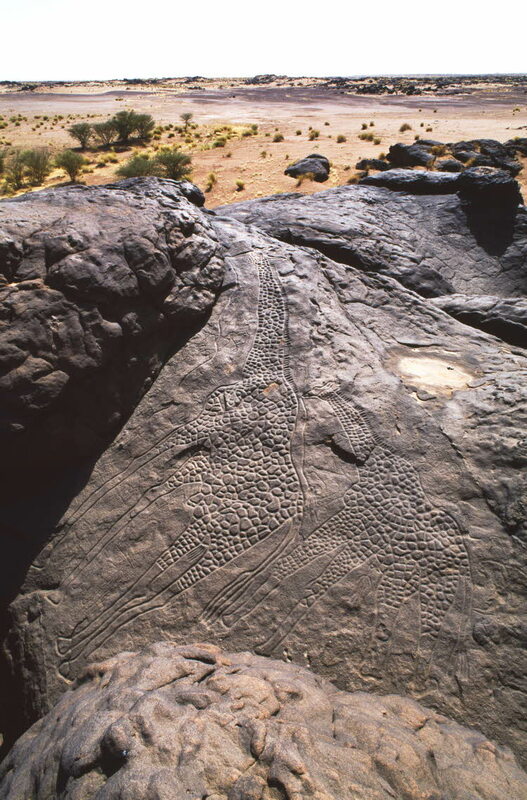 Hundreds of thousands of rock art sites have also been reported across the entire African continent, although sites are mostly concentrated in two specific areas: the Saharan Desert and Southern Africa. 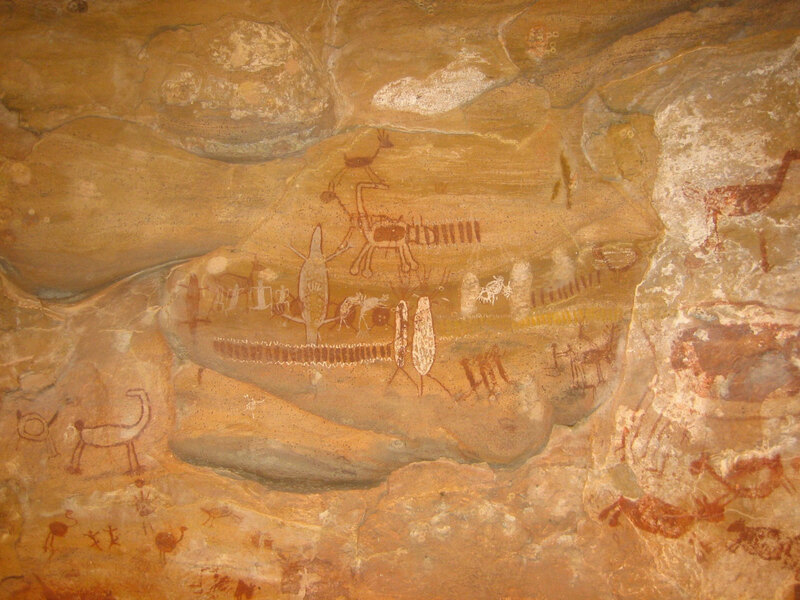 Rock art in the Saharan Desert area (Algeria, Chad, Niger) is comprised mainly of carvings and paintings illustrating anthropomorphic figures, mythical beings and animals like dromedaries and giraffes. In Southern Africa (Namibia, Zimbabwe, Tanzania and South Africa), there are images of anthropomorphic and therianthropic (combining human and animal traits) figures and elands. This animal played a very important role in the San Peoples’ beliefs. Their tradition of creating rock art spanned from about 3,500 years BCE to the 19th century. A wealth of rock art is also found in Asia. In Southern Asia, the hundreds of rock shelter sites at the Bhimbetka complex, in Central India are the most renowned. Pictographs representing scenes of hunting, battle and dancing, and mythological figures abound. Southeast Asia is particularly known for its rock art paintings in caves. In Indonesia, on the Sulawesi Island, some parietal paintings have been dated from 35,000 to 40,000 years ago and are considered to be among the most ancient figurative images in the world. In Oceania, petroglyphs have been mainly recorded. Motifs represented include abstractions, anthropomorphic figures, human faces, and animal and mythological beings such as the bird-man. Rock paintings in Shelter No. 8, in Bhimbetka, India. The work depicts men on horseback and on foot returning from war or group hunting. In Europe, a few thousand rock art sites are scattered across the continent. The best-known are the painted caves in France and Spain which date back to the Upper Paleolithic (between 45,000 to 10,000 years ago). Representations mainly illustrate animals surrounded by hand prints and geometric figures. European rock art also includes petroglyphs in Scandinavia and Northern Russia created between 5000 and 500 years before the Common Era. These images include anthropomorphic figures, boats, weapons, elks, and hunting and ploughing scenes. In Atlantic Europe (England, Ireland, Spain), abstract petroglyphs and Megalithic art – carvings on large rocks and rock monuments – are found, like at Brú na Bóinne, in Ireland. This art dates back to the Neolithic Period (4000 – 2500 years before the Common Era). Rock art in the Alps area (Italy, France) includes open-air carvings representing anthropomorphic figures, houses, battle and ploughing scenes, cattle, and geometric figures. This art was created during the Neolithic Age (4th millennium before the Common Era), the Bronze Age (2nd millennium before the Common Era) and the Iron Age (1st millennium before the Common Era). Many rock art sites are found across North and South America. From Patagonia to Alaska, there is a wide variety of rock art representations that date back to many distinct historical periods. They include the Nazca geoglyphs in Peru, in the form of gigantic animal figures such as monkeys and whales, phytomorphs, and anthropomorphic and geometric figures. 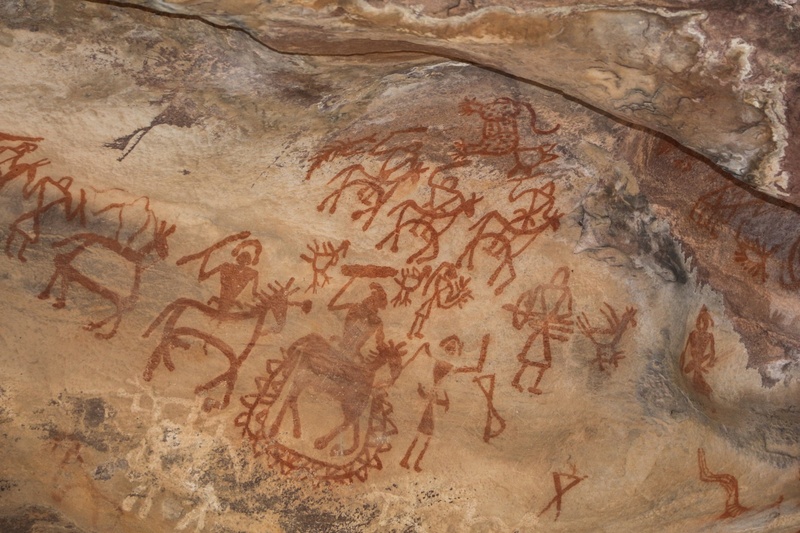 One of the richest rock art locations is the Serra da Capivara National Park in Northeastern Brazil, where pictographs are scattered in hundreds of rock shelters. The Baja California (Mexico) rock shelters are known mostly for their monochromatic and polychromatic life-size paintings of anthropomorphic and zoomorphic figures. In California, polychromatic abstract and figurative paintings created by the Chumash People are among the most elaborate in North America. The Great Basin (Nevada and California) is particularly renowned for its mountain sheep petroglyphs and anthropomorphic figures. In Utah, pictographs representing static life-size anthropomorphic figures appear to stare at visitors to the sites. In Canada, there are rock art sites from coast to coast. The exact number of sites has yet to be determined, but some 3000 sites are believed to exist. As elsewhere in the world, the assessed number of sites remains approximate due to natural (erosion) and anthropic (vandalism) destructions. Scientific interest varies across regions in the country. Hence, rock art in Ontario has been studied much more than in Quebec as is evinced by the number of sites identified in the two provinces. In the Atlantic Provinces, the existence of only 14 petroglyph sites has been confirmed in Nova Scotia and New Brunswick. They have been found mainly on rock outcrops and erratics or boulders, often near bodies of water. These sites date mostly back to the post-European contact period. 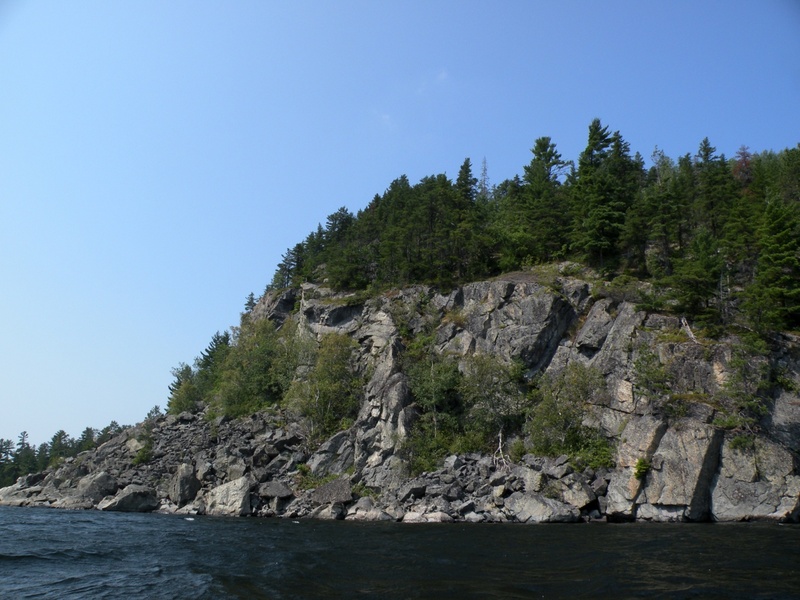 Many rock art sites have been found from Quebec to Saskatchewan across the vast region known as the Canadian Shield. The number of pictograph sites is estimated at 800, with most recorded in Ontario. In Quebec, twenty or so rock art sites have been identified. In Manitoba, there are close to 120 sites, in Saskatchewan, some 75 sites, and only one site has been identified to date in the Northwest Territories. The largest concentrations of sites are found in Northwestern Ontario, Eastern Manitoba and Northeastern Saskatchewan, along the Churchill River. Most pictograph sites are situated out in the open, on cliffs along lakes and rivers. A few sites have been discovered on rocks, erratic boulders and in rock shelters, both near and away from water. Only thirty or so petroglyph sites are known to exist. The petroglyphs have been identified not only on rock outcrops and erratic blocks near the water, but also deep in the forest. Petroforms and lichenoglyphs have also been found across the Canadian Shield. 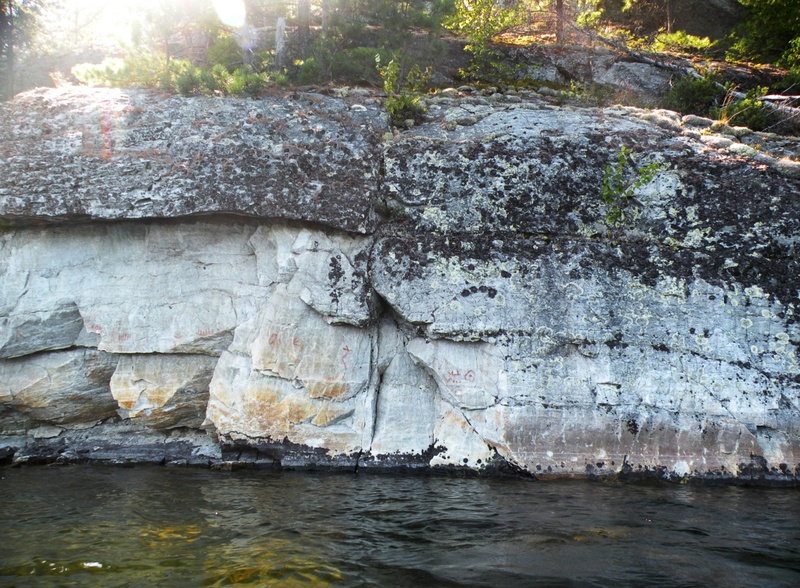 Petroforms representing turtles, birds and anthropomorphic figures have mainly been recorded in Manitoba (at the Whiteshell Provincial Park) and at a few other sites in Northwestern Ontario. Lichenoglyphs have been reported in ethnohistorical and ethnographic sources, but their short-lived nature has prevented a more in-depth study of this phenomenon. On the Plains (Saskatchewan, Alberta), hundreds of petroglyph and pictograph sites have been found on cliffs, rocks, erratic blocks and rock outcrops. Among the major rock art sites in Alberta is the Writing-on-Stone complex and the Verdigris Coulee, Crossfield Coulee, Zephyr Creek, Okotoks Erratic and Grotto Canyon sites. In Saskatchewan, the St. Victor Petroglyphs and Herschel Petroglyphs sites are among the most well-known. The Plains petroforms represent anthropomorphic figures such as snakes, buffaloes and turtles. There are also boulders on which lines were carved to evoke the spine and ribs of buffaloes. Sometimes, eyes, ears, a mouth and horns were pecked into the rock to further enhance resemblance to this animal. Those rocks are called ribstones. Several Plains rock art sites are located in places that afford sweeping views of the surrounding landscapes. British Columbia has an extremely rich rock art heritage. There are close to 1300 petroglyph and pictograph sites on the Northwest Coast and inland. A few sites combine pictographs and petroglyphs. Some 800 sites have been identified along the Pacific coastline. These sites are found on rocks, rock outcrops, cliffs and sometimes, in caves. Most often, artists chose locations near the sea as well as riverbanks and lakeshores. The largest clusters of rock art sites are found at these locations: the Fraser Valley, the Squamish Valley, the Sechelt Peninsula, Vancouver Island, Gabriola Island, the Roscoe Inlet, the Spiller Channel, the Skeena River and the Tsimpsean Peninsula, in the northern part of the province. The Kwakwaka’wakw (Kwakiutl) and Coast Salish territories are particularly rich in pictograph sites. The number of pictograph sites on the inner plateau is estimated at 500 sites on rock outcrops and in rock shelters. Some forty petroglyph sites have been identified, for the most part near waterways. Lastly, there is a large number of sites in the valley of the Stein River, in the Fraser Canyon and at Lake Stuart. Several sites are also located along the Fraser River. In Nunavik, Quebec, four rock carving sites have been identified. These sites are the only ones known to exist today in the Canadian Arctic. They are all located in the eastern part of the Ungava Peninsula. 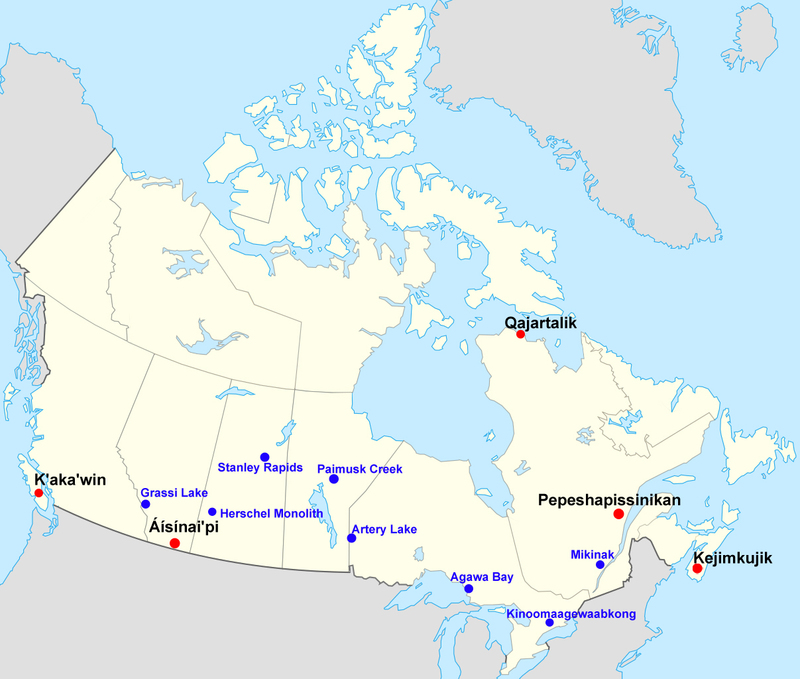 The most well-known of these sites is the Qajartalik site. 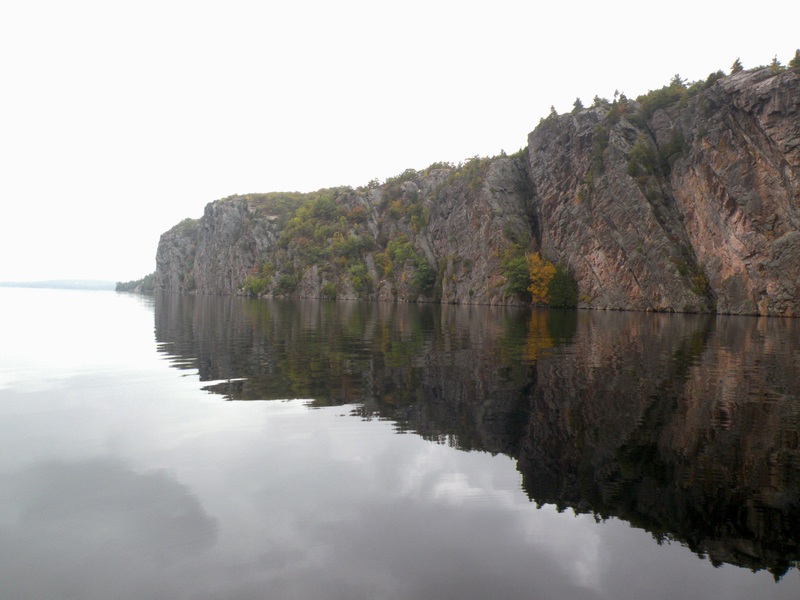 Bon Echo cliff, Mazinaw Lake (Ontario). This place is known for its remarkable echo. The cliff rises up to 100 metres above the lake and extends for 1.5 kilometres. There are more than 260 pictographs present, making it one of the most important rock art sites in Canada. Research on rock art sites has shown the importance of their location in understanding their significance and functions. These sites are often associated with spiritual forces and they are inhabited by non-human beings, as evidenced in some Indigenous oral stories. In Canada, rock art is mainly found at open-air sites. The natural aspects of places played a role in the selection of sites to create rock art. The characteristics of the rock surface such as its unusual colour, the presence of cracks or quartz veins, and silica or calcite deposits that reflect the sun’s rays are all selection criteria. The shape of the rock was also important: powers often converge in unusual geological formations, such as the hoodoos, or Fairy Chimneys, effigy rocks and high mountains. Hence, rock art sites located on high cliffs are often associated with the presence of powerful spiritual entities. Along the same vein, the features of the landscape surrounding the sites, such as high mountains or waterfalls, increase the sites’ spiritual power because these features are often considered sacred. Acoustic anomalies like the echo or the particular resonance of a rock outcrop enhance the power of such sites. For example, accoustic phenomena occur when people or animals make their presence known by walking across the rock’s surface or by making any other type of sound. Natural phenomena such as thunder can also contribute to this acoustic dimension. Diamond Lake site, Ontario. This site is imbued with an unusual character, owing to the whitish colour of the rock. Canadian rock art sites are part of the cultural environment of Indigenous Peoples. These places have been meaningful for them from time immemorial. These sites are part of a network of places and routes related to traditional practices (for instance, hunting ceremonies), creation stories and place names. Rock art sites play a major role in Indigenous traditions, because the stories and rituals associated with them sustain the link with ancestors and traditional territories. For the First Nations and Inuit of Canada, place names or toponyms are most often descriptive and concrete. They allude to landscape features and activities or events related to specific locations. Sometimes, they refer to the physical environment of sites and highlight the topography, hydrography or vegetation of a particular place or even its animal resources. Place names also refer to individuals, oral stories, spirits and medicine man practices. Toponyms actually provide practical information about the environment, and they are useful when travelling across the territory. Rock art place names can refer to powerful beings, to the presence of images (Áísínai’pi, Pepeshapissinikan) or to individuals. For example, sites and lakes called “Fairy” refer to beings, such as the Memekueshuat, who dwell in the rocks. Such is the case of the Fairy Point site on Missinaibi Lake, in Ontario. The site on Tétépisca Lake, located in the North Shore region of Quebec, was named by the Innu people as Memekueshushuap which means “the house of the Memekueshuat.” In fact, 25 metres to the left of the site’s painted panels, there is a cave likely the entrance to Memekueshuat’s house. In Ontario, some traditional place names of rock art sites refer to birds. The traditional name Kaw-gaw-gee Waw-bee-kōng, which means “Raven Rock White Cliff beside the Water,” suggests the fact that this bird nests on high cliffs. These birds also evoke thunderbirds, while the whitish mineral flows often found on cliffs are associated with their droppings. Lastly, sites can also recall the memory of medicine men associated with them. For instance, south of the City of Nanaimo, in British Columbia, the Thuxwum site is known by the name of a medicine man who once lived there.